It was just after this point that the Lumix's sensor became self aware and ceased to function for its operator. It has decided to look at the world through different eyes; a world of flickering, contrasty colors with shutters half open. Could it have been the new pinhole lens? I'm sure it was just an unfortunate coincidence; bad timing to play with the new toy. Whatever the case, a brick is a brick. Damn. Otherwise, the Wanderlust Pinwide is a fun little piece of engineering with an amazing range. 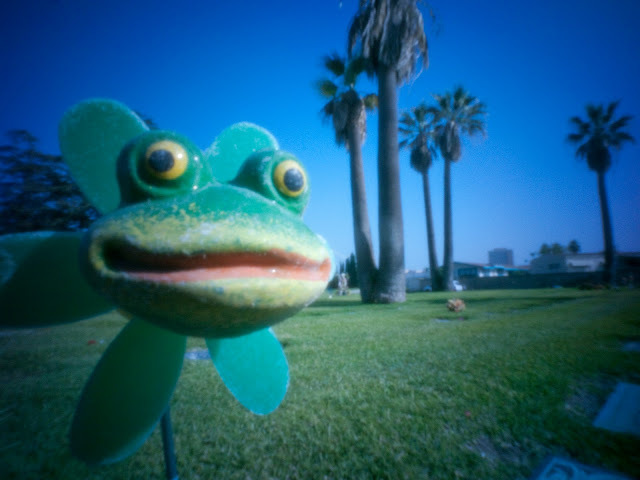 The frog whirligig, left, is only about an inch and a half high [4cm] away from the lens. Look at that focal range; aperture is about f128? So says the manufacturer. This shot was taken at ISO 400 at 1/8 sec., handheld.